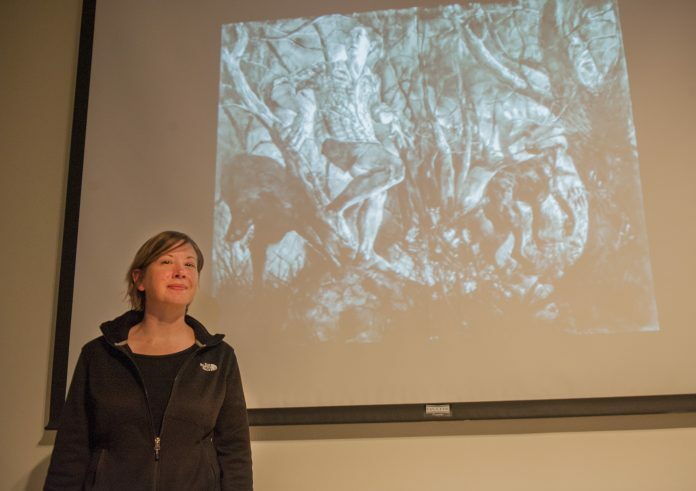 The Mark A. Chapman Gallery hosted real-to-life surrealism artwork on Monday in conjunction with a lecture by Melanie Johnson titled “Close.” Johnson spoke on how experiencing different art forms helped shaped her style and form within her future works. “I wanted to touch on those things that I am thinking about and patterns I find in my work,” Johnson said. Drawing inspiration from other artists as an undergrad helped her think about creating narrative within her work, Johnson said. “Philip Guston is someone that I have thought about,” she said. “There was something about his painting that really resonated. The way a person creates the art is something that she said to look at when examining it. Toward the end of her graduate career, she began to move toward drawing instead of painting, which allowed her to create at a new pace. Using drawing as preliminary to painting, Johnson said she thought about how drawing could do more work than they were. “This allowed me to grapple with the things I didn’t totally have control over in paint,” she said. Her pregnancy with her son, Tilman, led to more thoughts how we see our bodies versus how we feel in them. Using herself as a model, she created pieces that would represent how in her mind it felt to be in a body. Johnson also visited and spoke in classes to art students. They were very grateful for some of the ideas she presented, Teresa Schmidt, professor of drawing, said. “Especially on the way space is handled, they really appreciated that.,” Schmidt said. 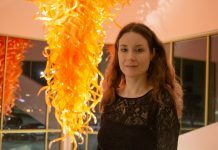 Johnson received her Master of Fine Arts in Painting from Indiana University and is an associate professor of arts and design at the University of Central Missouri, where she is also the co-coordinator of the Alumni Foundation program. 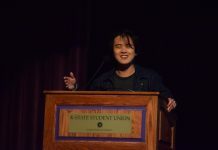 The lecture was presented a part of the 2018-2019 visiting artist series from the Kansas State art department and is funded by the SGA Fine Arts Fee. 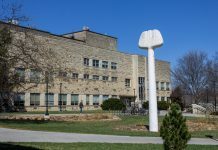 “We are able to bring out dynamic visitors because of that funding,” said Erin Wiersma, associate professor of art and area coordinator, who helps coordinate these visits.